-We go right to the ring to kick things off. The Roughnecks are roundly booed upon their entrance and the fans show their love for Los Ice Creams. CHIKARA has a nice entrance set up for an independent promotion at the arena with several video screens showing the Anniversario logo. RADICAN'S ANALYSIS: This was a fun opening match. (2) Ophidian vs. Arik Cannon. Before the match Ophidian takes an Arik Cannon sign from someone in the crowd and rips it up in the center of the ring. Bryce Remsburg is in on commentary now with the ring announcer Louden Noxious. Ophidian wrestles in a full Egyptian style headdress and really has a unique look and incorporates a lot of snake-like maneuvers into his repertoire. Ophidian locks Cannon in a nasty full-nelson on the mat using his legs and then turns Cannon over into a pinning predicament for a 2 count. Although Ophidian is a heel, the crowd is split and several "hiss" at him like a snake in support. The crowd tries to rally Cannon, who finally fires back with a nice neckbreaker. Ophidian fires back quickly and slides through the ropes and comes back out the other side and takes Cannon down with the headscissors. The crowd rallies behind Cannon again, who makes another comeback with a series of clotheslines and a leaping back elbow. Cannon then hit a big exploder suplex on Ophidian for a nearfall. Cannon then went for a moonsault off the second rope but misses. Ophidian then nails him with what can only be described as a code red facebuster for a nearfall that the crowd cheers. Cannon goes for a brainbuster, but Ophidian slips through and locks in the Ophidian death grip with all his weight on top of Cannon's shoulders. Cannon manages to shift Ophidian around and all in one motion lifts him up and plants him with a brainbuster, but Ophidian kicks out and the crowd is hot. Amasis and Ophidian celebrated in the ring after the match while the crowd booed. RADICAN'S ANALYSIS: This was a fun match, although they did do a lot of false-finishes at the end for an undercard match. The crowd was really into this and behind Cannon throughout. (3) Order of the Neo Solar Temple (Crossbones & Ultra Mantis Black & Delirious) vs. Saturday Night Slam Masters (Create-A-Wrestler & Player Uno & Player Dos). Chikarason and Noxious are your announcers for this match. Delirious attacked CAW at the bell and nailed him with a cobra clutch slam. After a period of fast-paced action Dos went for a slam on Crossbones, but he fell right on top of him. The announcers said Delirious was under the control of Mantis as he nailed Dos with a big suplex to a round of boos from the crowd. Mantis continued his assault on Dos for several minutes and applied a nasty looking submission on him on the mat before tagging in Delirious. The crowd booed as Delirious & Crossbones hit several double team maneuvers on Dos. They booed even louder when the Order of the Neo Solar Temple performed a triple team maneuver on Dos, but Uno broke up the pin. Dos finally fired back on Crossbones in the corner, but got caught with a Samoan drop for his troubles. Crossbones went for a backdrop, but Dos caught him with a DDT. Delirious ran into the ring and tried to cut him off, but he escaped and tagged in Uno who ran wild. CAW came off the top and took out Crossbones and Delirious with a splash off the top and the crowd popped. CAW continued to fight off multiple men and nailed Mantis with a DVD. Uno followed up with an elbow drop off the top, but Crossbones broke up the pin. Crossbones managed to clear the ring and all three members of the Temple hit a chokeslam on player Dos, but Uno broke up the pin. The finish saw Uno and CAW hit dives to the outside on Delirious and Mantis on opposite sides of the ring. Dos managed to lift the big man Crossbones up and nailed him with a DVD, but Crossbones kicked out. RADICAN'S ANALYSIS. This was a solid match. The last few minutes were really good with Dos showcasing his high-flying skills, but the heels got the win in the end. Dos is a lot of fun to watch and the match told a good story as well with Delirious being held under the control of Mantis. -We went to a backstage promo with the Unstable. Colin Delaney said tonight was the night it all ended between them and the team of D-Lo Brown & Glacier. Chikarason came into the picture and asked why they were making threatening phone calls to the offices and the cameraman was forced to stop filming as they talked in the background. (4) The Unstable (Colin Delaney & Vin Gerard) vs. Glacier & D-Lo Brown. Delaney was introduced as a huge star prior to the match and was roundly booed along with Gerard when they made their entrance. Gerard and Delaney jumped Brown and Glacier right at the bell. Chikarason was on once again with Noxious as the announcers. They talked about how these four men had been at odds since the Trios Tournament held in February. Brown and Glacier quickly took the upper hand as Brown beat on Gerard. Delaney attempted to blind tag himself into the match, but Brown cut him off right away. The announcers talked about how Brown and Glacier were real stars unlike the arrogant Delaney and Gerard, who consider themselves big stars. D-Lo hit a slingshot press to the outside on Gerard. Delaney and Glacier went at it on the other side of the ring (I was hoping for a dive from Glacier, but no dice). Stigma came out and attacked Brown from behind and threw him into a post on the outside. Gerard and Delaney managed to isolate Brown in their corner and tagged in and out of the ring to wear him down as the crowd booed. After the match Stigma ran into the ring, but Glacier nailed him with a superkick. Brown then went up top and nailed Stigma with the Lo-down. RADICAN'S ANALYSIS: This started out well, but when Gerard got the heat on Brown, the match crawled to a stop. There were a lot of awkward exchanges leading up to the finish, which seemed forever to set up as Glacier wasn't moving too quickly. 2.0 were shown backstage, but they refused to talk. A crawler came across the screen saying they were going to talk until got 1 point towards a shot at the tag titles. In CHIKARA, you need to get 3 points to challenge for the tag titles. Each team gets 1 point for a win and the points are reset if a team loses a match. (5) 2.0 (Jagged & Shane Matthews) vs. The Sea Donsters (Tim Donst & Hydra). Hydra came out in a muscle suit. Jagged said he was going to get busted for a wellness violation. Matthews took Donst guitar and said he wanted to play a song, but he ended up swinging it at Donst, who ducked. Donst took down Matthews with the stroke as the bell rung to start the match. Hydra and Donst strutted together until Jagged tossed Hydra to the outside. Matthews cut off Donst and locked in the Boston crab. Hydra ran at Matthews, who cut him off and then applied the Boston crab on him. Donst recovered and ran at Matthews and he caught him with a Boston crab. Jagged ran into the ring and Matthews let go of him and applied the Boston crab on his own partner. That was funny. RADICAN'S ANALYSIS: This was just a short comedy match designed to get 2.0 their 1 point towards a shot at the tag straps in CHIKARA. -Jigsaw, Lince Dorado, and Helios cut a promo backstage. 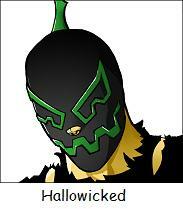 Dorado and Helios were mad at Jigsaw for taking the pin in their match the previous night. They were also upset about Jimmy Olsen not being able to tag with them tonight due to injury. 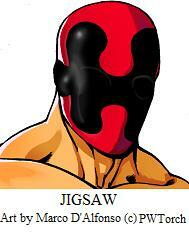 Jigsaw said he had done his best. Mike Quackenbush then came into the picture and said he was "plan B" for this encounter. Everyone seemed pleased. (6) Frightmare & Hallowicked & Cheech & Cloudy vs. Jigsaw & Lince Dorado & Helios & Mike Quackenbush. Frightmare and Hallowicked came out dressed in green. Then they came out again dressed again in orange, but it was Cheech and Cloudy dressed up like Hallowicked and Frightmare. Cheech and Hallowicked #2 also known as Cheech ran into the ring and went at it with Jigsaw early on at an incredible pace. Frightmare, dressed in orange ran into the ring and went at it with Dorado. This was very much like the action featured on "Enter The Dragon" PPV from DGUSA. Frightmare ran around the ring and tried to get the fans fired up. Hallowicked went to the outside and reminded him he still had to wrestle. Helios and Frightmare #2 also known as Cloudy came into the ring and went at it with Helios at a rapid pace. Cloudy ended up sending Helios to the outside and went for a dive, but Quackenbush back dropped him to the floor. Dorado ended up isolated Frightmare in his own corner and tagged in Jigsaw, who stretched him out with a submission. Quackenbush tagged into the match and put Frightmare in the torture rack and then dropped him to the mat. Quackenbush then nailed him with the double knees for a 2 count. Helios tagged in and nailed Frightmare with a standing shooting star press for a nearfall. Frightmare finally took down Quackenbush with a clothesline off the top and tagged in Cloudy. Cloudy ended up nailing Jigsaw with a spinning DDT and rolled out of the ring, which allowed Hallowicked to legally come into the match. Hallowicked nailed Jigsaw with a mafia kick for a 2 count and the crowd popped big. The crowd gave all 8 men a standing ovation after the match. RADICAN'S ANALYSIS: This was an awesome match with incredible action from bell-to-bell. Nobody really stood out in the match, but as a collective effort, this was a lot of fun to watch. I loved how Cheech and Cloudy were dressed like Hallowicked and Frightmare. The crowd really showed their appreciation for this style of wrestling after the match. This wasn't as good as the CHIKARA 8 Man Tag match from DGUSA's "Enter The Dragon" PPV, but it was darn close. -Eddie Kingston cut a promo. He talked about how close he was with Claudio Castagnoli. He said they even lived together, but when he had to move to New York, Castagnoli wasn't there for him. Kingston talked about their last match in CHIKARA. He said he was proud of the match and wasn't mad that Castagnoli beat him, but he was embarrassed that Castagnoli didn't have the respect to shake his hand after the match. Kingston said Castagnoli had no respect or honor. He said it was going to get personal tonight and he wasn't going out there tonight and be violent, but instead he was going to humble him by beating him in a wrestling match. This was a really good promo. (7) Eddie Kingston vs. Claudio Castagnoli. Both men went right to the mat and literally wrestled. Kingston had the upper hand early, but Castagnoli countered and got the upper hand. They exchanged some MMA style kicks before Castagnoli dead-lifted Kingston and suplex him to the mat. Both men then exchanged slaps to the face. Castagnoli hit a gut wrench suplex, but Kingston got up and slapped him right in the face. Castagnoli slapped him right back and then nailed him with an uppercut. Kingston eventually fired back and raked Castagnoli's eyes and took him to the mat with a suplex. Kingston taunted Claudio, who charged at him. Kingston raked his eyes again. Castagnoli blindly threw some slaps at Kingston, who retaliated with a big slap. Castagnoli continued to sell like he couldn't see, as Kingston picked him apart with punches. The announcers said Kingston had a history of telling false stories like the one he told about Castagnoli in his promo. Castagnoli caught Kingston coming off the ropes and nailed him with a Samoan drop. Castagnoli hit a springboard European uppercut and the crowd roared. He followed up with an airplane spin and covered Kingston for a 2 count. Castagnoli stalked Kingston and nailed him with a big running European uppercut for another 2 count. Claudio went for a German, but Kingston countered it into a DDT. Both men exchanged forearms, but Kingston sent Castagnoli crashing to the outside with a Yokuza kick. Kingston then got a running start and nailed Castagnoli with a dive through the ropes to the outside. Both men exchanged slaps on the apron. They then countered each other on suplex attempts. Kingston nailed Castagnoli with several chops, but Castagnoli managed to clothesline him over the top rope and back into the ring. Claudio followed up with a big European uppercut on Kingston, who was draped over the middle rope. Castagnoli then hit a big running kick before nailing Kingston with a fantastic looking springboard splash for a nearfall. Kingston ducked a clothesline and nailed Castagnoli with a German. He then nailed Claudio with a big clothesline for a nearfall. RADICAN'S ANALYSIS: This was a really good match with Kingston playing into the storyline very well by simply refusing to get pin, despite all the big moves Castagnoli nailed him with. I really enjoy Castagnoli's work and once again, he was very good in this encounter. (8) Double Hair vs. Double Mask match: F.I.S.T. (Chuck Taylor & Icarus w/Gran Akuma) vs. The Colony (Soldier Ant & Fire Ant w/ Green Ant). The stipulations are that if FIST wins, The Colony lose their masks. If The Colony wins, then FIST has to shave their heads bald. If there's a double DQ then both teams lose and The Colony would lose their masks and FIST would lose their hair. The Colony charged the ring as they made their entrance and the action quickly spilled to the outside. Worker Ant nailed Icarus with a German from behind, but he got right up and nailed Icarus with a German of his own. Icarus got right back up and clotheslined Worker Ant down to the mat. The announcers put over the lengthy feud these two teams have had over which team was the best in CHIKARA. Icarus went after Soldier Ants mask, which would have been a DQ if he had been successful in taking it off. The crowd booed as Icarus stretched Soldier Ant on the mat. Fire Ant tried to run into the ring, which allowed Akuma and Taylor to double team Soldier Ant behind the ref's back. Icarus ripped Soldier Ant's top and began chopping his chest. The announcers said FIST was trying to take away the identity of the Colony. Icarus locked Soldier Ant in the Venus Fly Trap submission, which works the legs and then landed several forearms into Soldier Ant's neck before breaking the hold. Soldier Ant and Icarus began exchanging blows in the center of the ring. The crowd cheered each time Soldier Ant nailed Icarus and booed Icarus each time he fired back. Soldier Ant then sent Icarus to the outside and nailed him with a dive, which counted as a tag. Fire Ant ran into the ring and ran wild on Taylor. The Colony came off the top rope and nailed Icarus and Taylor with simultaneous double stomps. They then hit ants marching on Taylor, but he kicked out at the last second. The Colony went up top, but Icarus cut off Solider Ant and Fire Ant missed Taylor with a top rope senton. Taylor went for a chair, but the ref took it away from him. Fire Ant charged at Icarus, but he moved and Fire Ant nailed the ref with a dropkick. Taylor picked up Solider Ant off the top rope and nailed him with an omega driver off the top rope to the outside through a table and the crowd booed. Fire Ant managed to counter Icarus and nailed him with the air raid crash, but the other ref was busy attending to Soldier Ant, who was carried to the back. Icarus recovered and nailed Fire Ant with the pedigree for a nearfall. Taylor nailed Fire Ant with a chairshot to the back and followed up with a chair slam to the outside. The announcers put over the fact that Taylor and Icarus were breaking the rules now that there were no consequences. Fire Ant countered a pedigree on the ring steps, but Taylor was right there to drag him inside the ring. Taylor then nailed Fire Ant with a powerbomb for nearfall. Icarus tore at the mask of Fire Art and the ref warned him that he would DQ FIST and make them get their heads shaved. The crowd chanted "Fire Ant, Fire Ant," who was taking a sustained beating from Taylor & Icarus. Fire Ant mounted a comeback and nailed Taylor with a stunner. 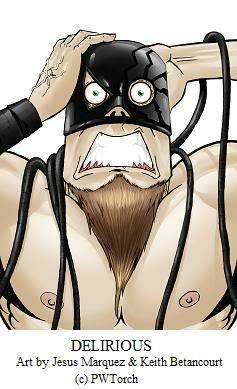 He then took out Icarus and Akuma with a huge dive over the ropes to the outside and the crowd roared. Fire Ant hit a moonsault onto Taylor off the ring steps and turned it into a DDT. The crowd chanted "he's on fire" as Fire Ant continued to defy the odds. Fire Ant hit a huge kick to the side of Icarus's head inside the ring. He followed up with another big kick to the side of Icarus's head. Taylor then ran into the ring while Icarus distracted the ref and nailed him with a low blow. Taylor then covered Fire Ant for a 2 count. Taylor immediately locked Fire Ant in a single leg crab. The crowd chanted "please don't tap, please don't tap." The crowd chanted "shave their heads" after the match. Taylor and Icarus didn't look very happy. Icarus and Taylor ended up sitting down in the ring as Chikarason cut their hair. 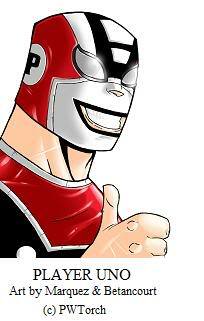 Chikarason then gave the Colony clippers, which sped up the process. The Colony didn't really finish the job, as they left the ring after making Icarus and Taylor bald up top. Taylor and Icarus looked very angry and sad as the Colony left the ring. RADICAN'S ANALYSIS: This was a great match. The crowd was really into this once FIST had the heat on Solider Ant during the early stages of the match. Once Soldier Ant got taken out, which left Fire Ant to go at it alone, the heat really increased and Fire Ant was really good making fiery comebacks against his cheating opponents. The moment when Soldier Ant came crawling back towards the ring was awesome and the crowd popped huge for it. I thought they went a little overboard with the nearfalls down the stretch, but this match is well-worth going out of your way to see. Overall thoughts: This was a really good release from CHIKARA. In fact, it's one of the best non-big tournament shows I've seen from CHIKARA. There are a number of good matches up and down the card and there was only one match that wasn't very good. The best thing about this show was the crowd heat. The crowd was really into just about everything, but the show built to the main event and nothing on the undercard wore out the crowd. The main event was just awesome from a booking standpoint and in the ring. Having Soldier Ant get taken out of the match and then come crawling back to ringside was a great touch. The crowd was so into the Colony and desperately wanted to see them beat FIST, who were roundly booed throughout the match. The post-match haircut was great as well with Icarus and Taylor selling their disappointment superbly. If you're looking to try CHIKARA for the first time, this is a great place to start. This promotion isn't for everyone, but to me, they've got something really good going in 2009 and I feel this card is a good illustration of the progress and growth of the company in the last year. Sean Radican and co-host Derek Burgan record ROH themed audios on the Radican Audio Showcase on most weekends that are made available exclusively to Torch VIP members. Sean also reviews nearly every ROH DVD release for Torch VIP members.